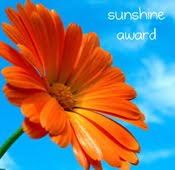 I have received the sunshine Award! From Something Magical Could Happen a very cute individual blog, thank you ! Many Different topics, and love the inventive name, from fashion to music, and entertaining and full of youth! Well it could seem I'm going on about fashion blogs, but they are all different in their own right. This blog offers insight in designers, and her view on fashion, and bits of her own life. With her own Fashion designs and purchases it is really inspiring, a must read. Beautiful blog, with beautiful images, always making you think, lovely images. Beautiful photos, always changing theme, beautiful to look at, and a very nice blog! Has a very individual style, and intrigues me always to see what she is doing with her outfits, love the blog, fascinating. A blog full of fashion images from individual amazing collections, and sometime just the 'scrapbook', photography enchants me and as does this blog! Awe! I am so flattered! Thank you for thinking of me and for the kind words spoken! You are a doll! Thank you so much, Izzy! I'm honoured. And ou have two of my favourite blog-friends, Roz (clothes cameras & coffee) and Stephanie of Style Odyssey! (We've even met up - in Florida! - she's wonderful). You're all very welcome and thank you, you all deserved it ;)! Aww, thanks for the award - that was very kind of you! Its always nice to come across people who like my blog, so thanks..
And as Jill mentioned, I recognize some of the other people on that list! Ehem!!! What about me??? Ha - im messing!!! ahh sorry!! I did short-list you!